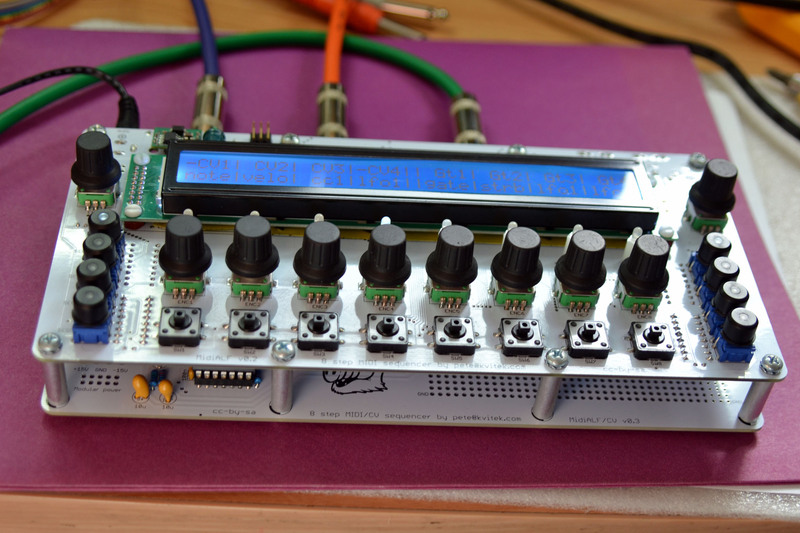 MidiALF is an 8 step DIY friendly MIDI/CV sequencer with 40×2 LCD, 8+2 clickable rotary encoders, 8 LED switches and 8 tactile switches. 8 steps in 4 sub-sequences which could be linked as two 16 step sub-sequences or one 32 step sequence. Sequence direction: forward, backward, pendulum, random. Conditional triggers for Note, CC1/2 and re-trigger, similar to the ones in Elektron’s RYTM and Digitakt. No more static sequences, spice it up periodically, randomly or manually by pressing the SHIFT key! Note, Velocity, CC1/2 randomization. Note value can be randomized according to a selected scale which can be different for each step of the sequence. Try mixing different scales in the same sequence, endless joy! Note re-triggering, 2-16 per step, velocity and pitch modulated, chromatic or restricted to a selected scale. Also can be conditionally triggered. Now you can ratchet just like TD. Song mode: up to eight steps, each specifies the sequence to play, how many times and at what transposition. Sequence and step randomization using 167 music scales (thanks to MIDIbox.org). Real-time and step recording modes: records notes, velocity, legato and CC1/CC2 values. Two assignable CC LFOs with the period of up to 2 bars and sync to start, sequence and step in addition to free running. Internal storage for 64 programs each containing 4 sequences with setup parameters and 16 character name. Sysex send/receive of sequence, program or all programs. 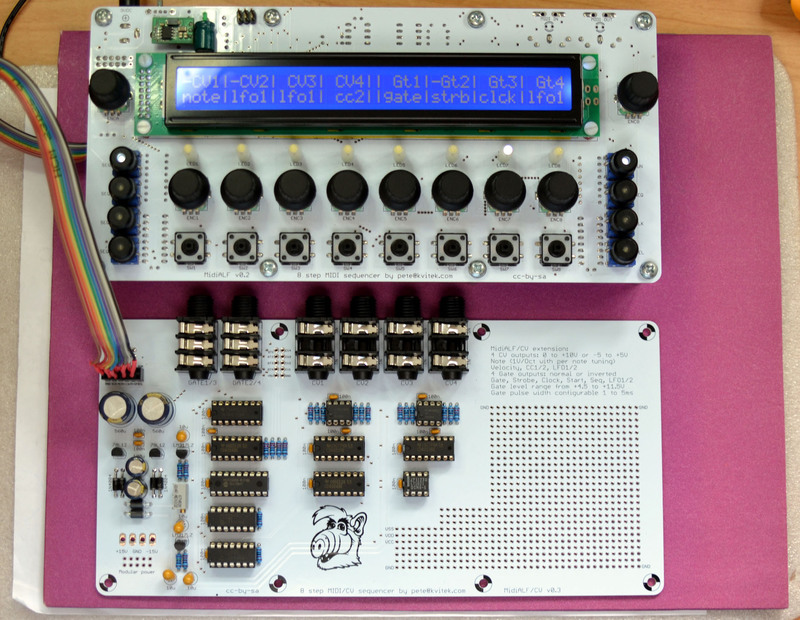 Super stable internal clock based on Mutable Instruments MIDIpal technology, 25-250 BPM. Optional CV extension board: adds 4 x CV an 4 x Gate outputs. Midi only variant is powered by external 7.5 – 9V DC power supply, center pin positive, minimum 300mA. MidiALF/CV variant needs 16VAC AC power supply. Eagle .sch/.brd files and v0.92 firmware .hex files files are available here. You can purchase MidiALF main board directly from me for US$35.00 and pre-programmed ATmega644p MCU for US$15.00. The CV extension board is US$30. The prices do not include shipping from California, USA. PayPal payments only. MidiALF is built around technology developed by Mutable Instruments: most of its hardware components can be found in various MI’s projects (mostly Shruthi-1 and Ambika), while software implementation uses quite a lot of code from MIDIpal. Not to mention the breakthrough Avril programming framework that brought modern C++ programming (read: productivity and sanity) to Atmel MCU world. Without this MidiALF project would not be possible, so thank you, Olivier, for sharing your talent with all of us! I’d also like to thank Thorsten Klose of MIDIbox.org for his kind permission to use music scale definitions and non-linear sequencer progression modes found in MIDIbox SEQ v4. MidiALF v2 Conditions are fully modeled after famous Elektron’s Trig Conditions. Whoever invented them at Elektron is a genius. This invention made the whole concept of sequencing a lot more interesting musically. Thank you, Elektron! Is there a way to change gate polarity per step in the gate page as opposed to changing the polarity on the cv/gate output page? I’m looking to engage/disengage switches via the sequencer. I’m not sure I understand your problem: gate polarity setting only changes the meaning of on and off states normal ( off is low, on is high) to inverted (off is high, on is low). It does not make any sense to change this setting per step. I think I was having an issue getting the gate to trigger in this case the echo cancel input of a Roland space echo. I think the issue was the velocity was set to zero. When the velocity is above 0, the gate seems to work fine. Yeah, per MIDI specification, if Note On event has zero velocity, it is treated as NoteOff, hence no gate in this case. Maybe use CV in stead of gate? Use the highest note for gate on and the lowest note (0V) for off. This is certainly doable, however keep in mind that CV-as-gate signals have somewhat slower rais and fall times comparing to digital gate signals. You can order it already mounted? I want to rehouse my MidiAlf into a custom enclosure. Do you know if any of the case designs of the recent years were made available? And another question, are you still developing on firmware 2.0? The only case design i;m aware of is acrylic from Frank. There is also a Euro panel from Altitude. ALF 2.0 — it’s still on the todo list, but it hardly gets any time allocated these days due to other things. Hi ! Can the MidiAlf sequence 4 tracks at once or does it have to cycle through the sequences ? MidiALF cycles through up to 4 sequences. So glad to hear that Alf 2.0 will/could happen someday! One thing that I would love is to be able to edit the other sequences while another one is playing. It’s hard to edit sequences when they’re linked as the pages keep flipping,and this would also be great for building songs or melodic progressions. Hey, this looks very interesting. I wonder if it is possible to transpose the recorded midi sequences live from the keyboard connected to the midi in port (like on MidiSEQ)? Absolutely! MidiALF transposes the playing sequence on each received note relative to the sequence root note. Anyone know if its possible to daisy chain e.g. MidiGAL and MidiALF to a single Midi thru box to run two synths on different channels? Yeah, i often clock MidiGAL, MidiREX and MidiALF from a MidiThru that distributes the master clock. Has anyone had any luck getting hold of Frank the case guy recently? Emailed a while ago but heard nothing so far. I don’t think so… there is a 1:1 GIF drawing of the MidiALF case floating around, but i did not verify it myself. just saw yout tweet. please send me your mail address so I can share with you. Hey Pete, if I build MidiALF without CV is it easy enough to add later or do I need to make that decision now? MIDI only MidiALF uses regular 7805 voltage regulator, whereas CV MidiALF uses more complex switching regulator. If you build your MIdiALF with switching regulator in advance, no changes will be needed later. 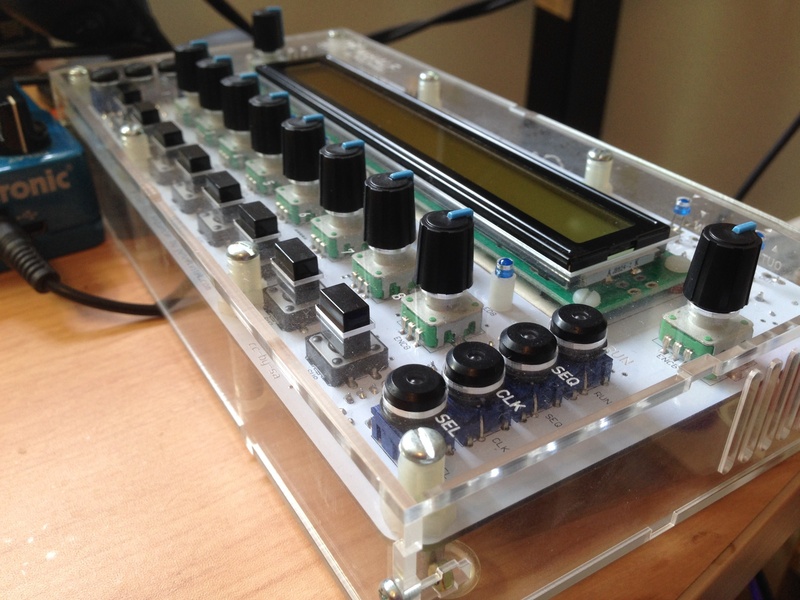 Hi there, I am looking for a Midi cc step sequencer to control a Bastl Microgranny which responds to cc 102 – 109. Will this do the job for me? Yep, MidiALF is an 8/16/32 step sequencer that handles note, velocity and 2 x CCs. Alternatively, you can try MidiSEQ https://midisizer.com/midigal/midiseq-sequencer/ which is also a step sequencer, but more like SH101 one. You can buy non LED variant of the MEC switches and insert a LED yourself. This is a lot cheaper than buying a switch with the LED inserted. You can also choose the color you like.